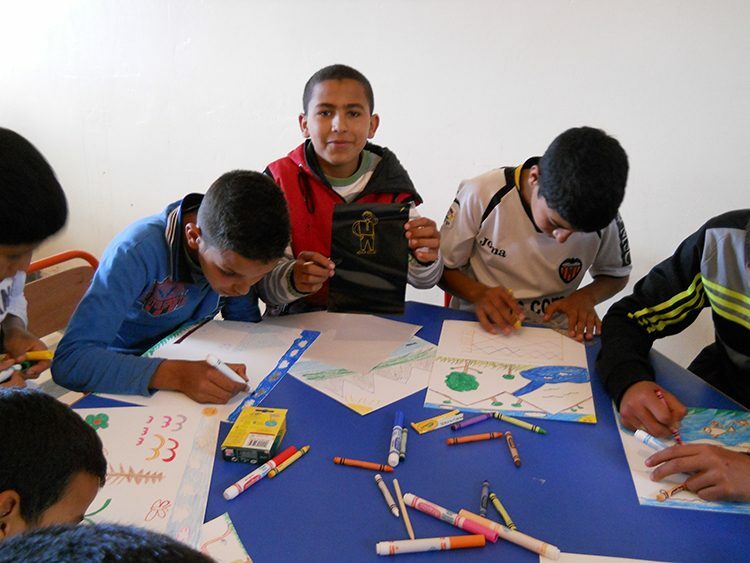 Last year, Phillips Head Librarian Karen Schneider spent time in the High Atlas Mountains, Morocco, teaching drawing to school children. She recounts the experience in this two-part blog post. See Part 1 here. Prior to my trip, my travel agent wanted to know the art project I had in mind. I was thinking that the students could draw themselves and a friend doing something together. Brigitte advised me to refrain from asking the students to depict people or animals because the people in the High Atlas Mountains practiced a conservative form of Islam that did not approve of creating images of living beings. After introducing myself in resurrected French, my guide translated my drawing instructions into Berber. I gave the students choices: they could draw the world around them, including mountains, trees, flowers, sky, etc, or they could draw a rug and decorate it. 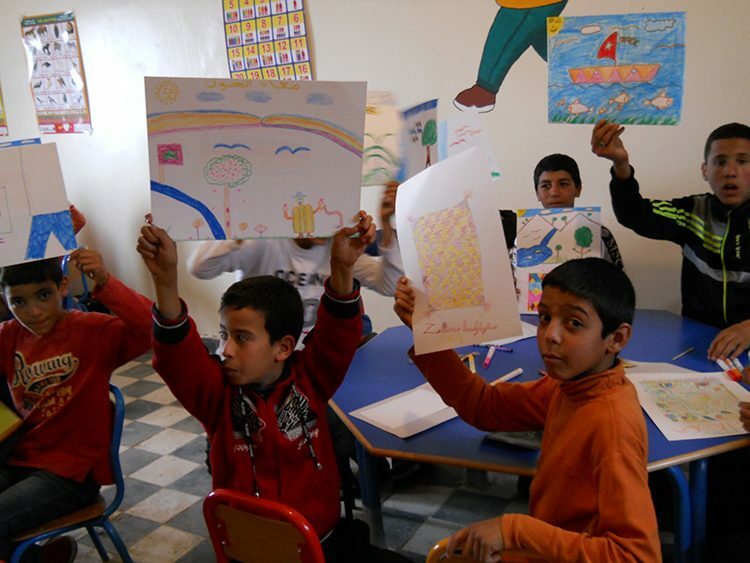 The students drew palm trees, rainbows, flowers, birds, insects, clouds, the sun, and a boat with a Moroccan flag. I was surprised to see that more than a quarter of the students drew people. It appears that drawing people and other living creatures is a natural part of child development and is something that cannot be easily controlled. 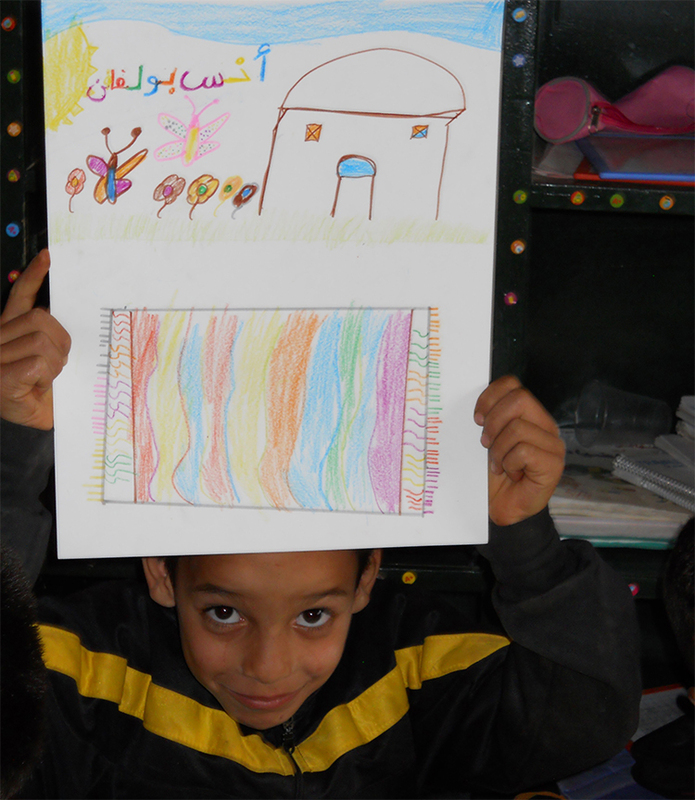 I walked around the classroom and saw that more than half of the students drew rugs: striped rugs, rugs with zigzag designs, diamond patterns, square patterns, organic curvilinear patterns, some with writing on the outside. On the inside were stars, circles, and hearts. Most of the students drew fringe at both ends of the rug or on all sides of the rug. The students were immersed in a textile culture. They observed weavers in their small community and it was likely that they sat on rugs to relax and to eat, and they may have slept on rugs, even wrapping themselves within a rug at bedtime. I said to some of the girls, “I want the rug that you drew for my house.” Giggling ensued. The drawing came to a natural end as most of the students finished at about the same time. They had worked for several hours and most of them made at least two or three drawings. They held their works up proudly for me to photograph. After the students finished, the teacher, my guide and I passed out small sketchbooks and a pen. The students received the supplies eagerly and I hope that they are continuing the habit of drawing. 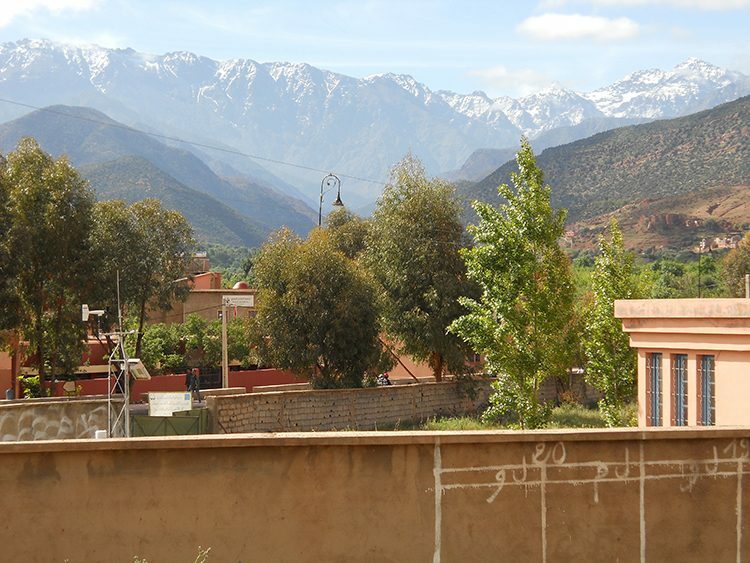 Last year, Phillips Head Librarian Karen Schneider spent time in the High Atlas Mountains, Morocco, teaching drawing to school children. She recounts the experience in this two-part blog post. From Marrakesh, it was a journey of an hour and a half to the Ouirgane Valley in the High Atlas Mountains, a remote, little visited region of Morocco. We were deep in the countryside when the driver pulled up to a grove of olive, fig and pomegranate trees. There we met with a guide who asked me if I was okay with walking to our destination, the only primary school in the area, where my travel agent had made arrangements for me to teach drawing to children. As I entered the Marigha school, it took me a moment to adjust from the bright sunlight to the dark and dingy interior. Thirty-two pairs of eyes were fixed on me with a mixture of curiosity and shock. The school didn’t have drawing paper, crayons, magic markers or art supplies in general, my travel agent alerted me in advance. 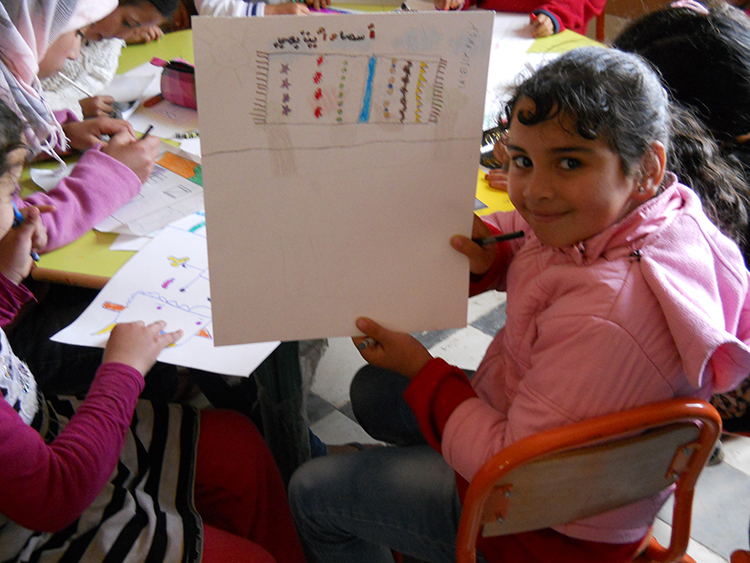 I came with all of the above and the teacher, Abdellah Ait Ougadir, a relaxed, friendly man who had excellent rapport with the students, helped me to distribute art supplies as did my guide and the driver.